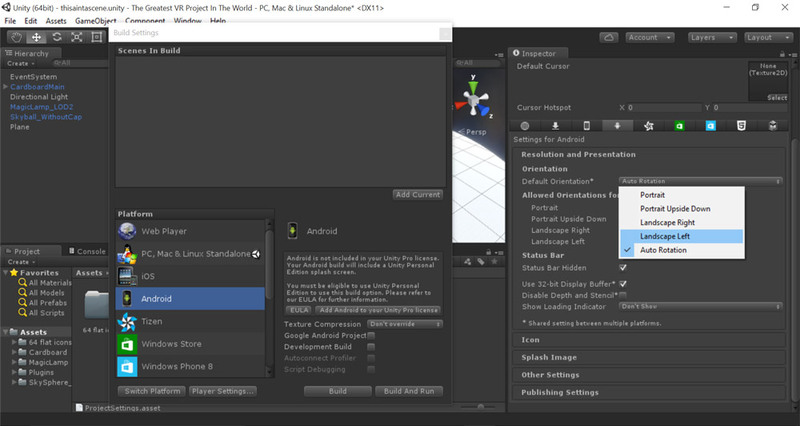 Unity is currently one of the most popular choices when it comes to building virtual reality applications. Google Cardboard is a great first choice for getting started in the field – spending $20 on a VR headset rather than potentially hundreds is a much safer bet for getting started (and there are plenty of people with smartphones who could potentially enjoy your app with an equally smaller upfront cost!). I’ve previously covered how to build VR for the web today via JS, along with demos on Visualizing a Twitter Stream in VR and JS and plenty others. For those who prefer Unity development, it’s about time I evened these numbers and wrote some more on VR development in Unity. 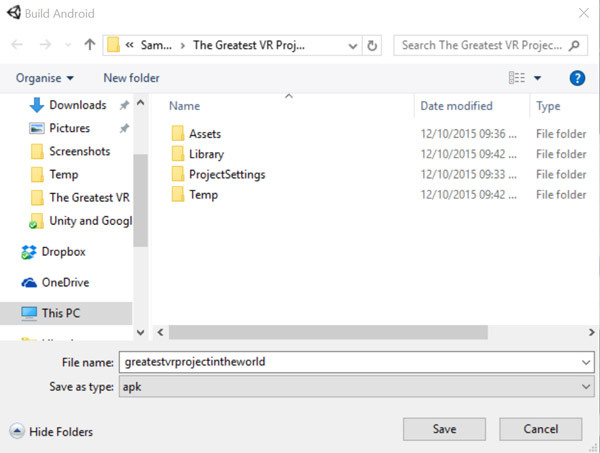 For some rather strange reason, I couldn’t find many in depth or varied guides to working with the Google Cardboard Unity SDK from scratch, so I did what any SitePoint writer would do. I put one together! Update as of 21st March: Since writing this article, Google has updated their SDK and changed how the crosshair functionality works. We have a new article covering these changes here. 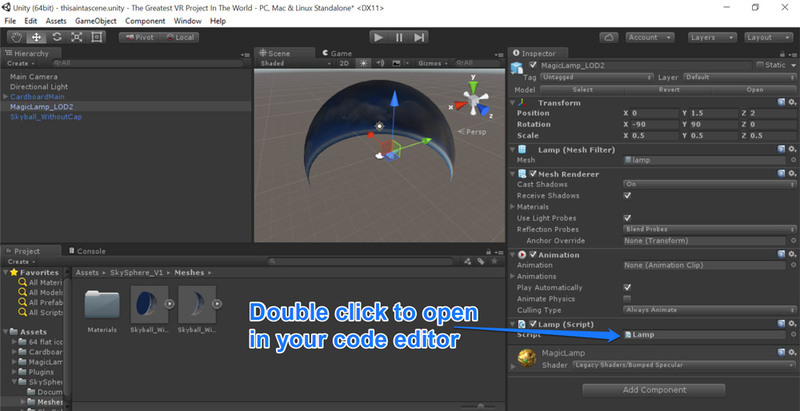 Most of this tutorial is still accurate, it is just the crosshair functionality which has changed. So follow along with this guide, then read the new article to get your crosshair working! Unity – At least v4.5 is recommended. 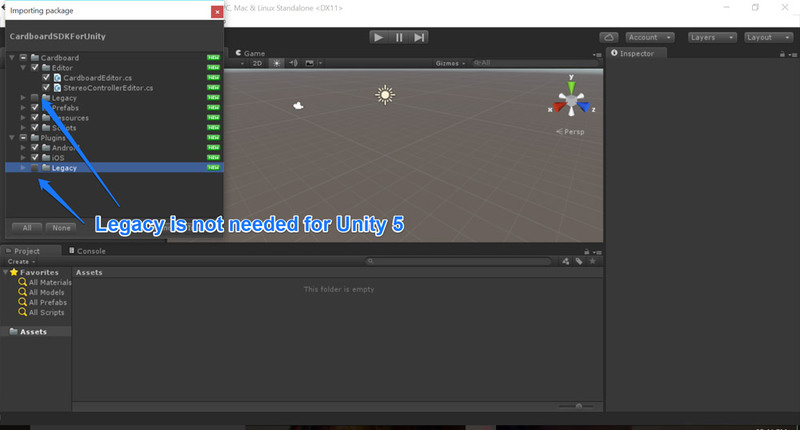 I’m using Unity v5 Pro for this guide. 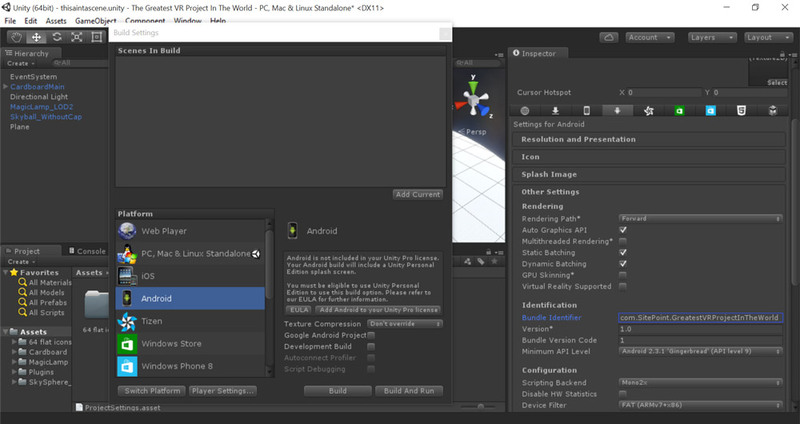 Unity v5 Personal apparently works a-okay too. 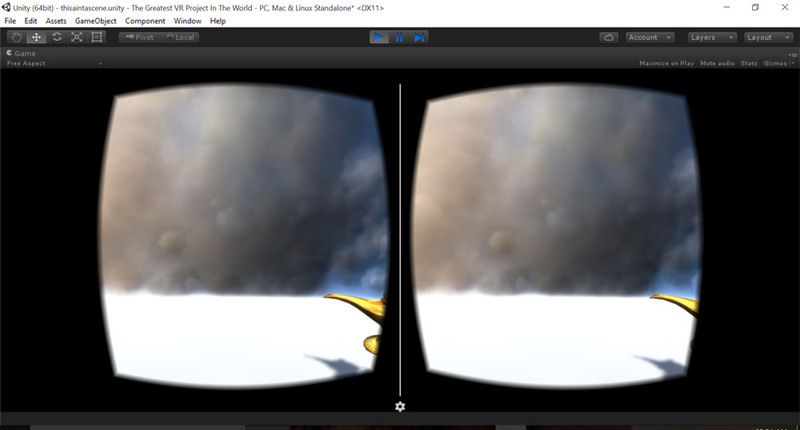 Cardboard SDK for Unity – That link will provide you with the GitHub repo. I’ll explain this and setting up Java and Android in this article. 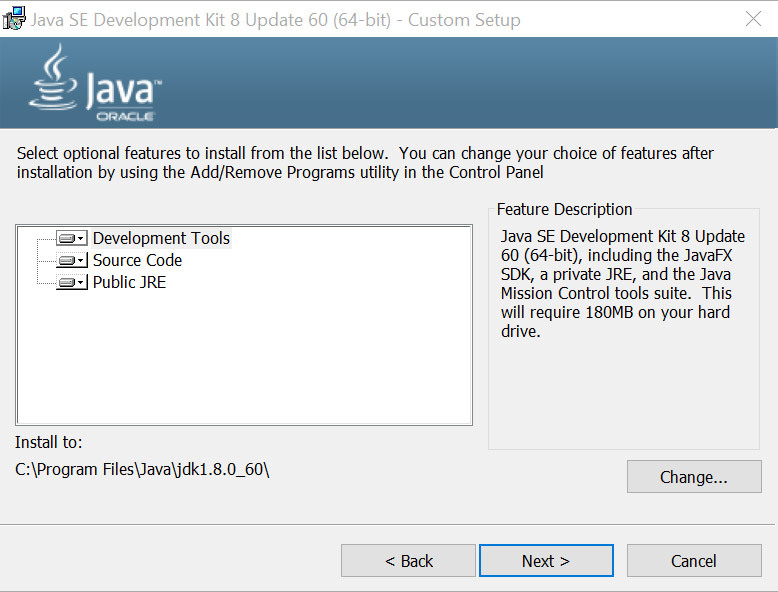 Java SE SDK – This will be required to install the Android SDK. 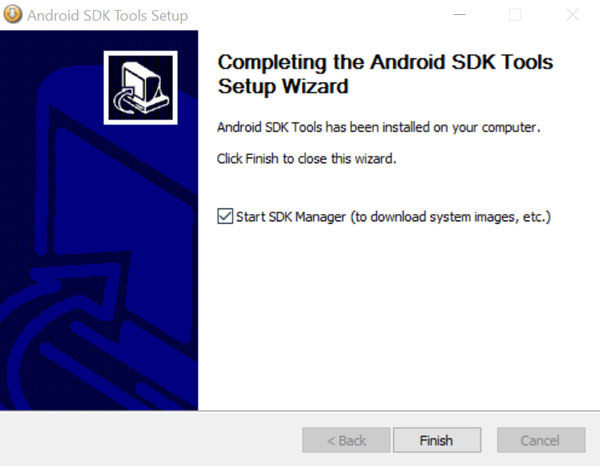 Android SDK – If you are downloading this for the first time, you only need the “SDK Tools Only” bits of the SDK. I’ll explain this soon. An Android device to put inside that headset – it is possible to export this to work with iOS, but I won’t be covering that process as I don’t have an iPhone! 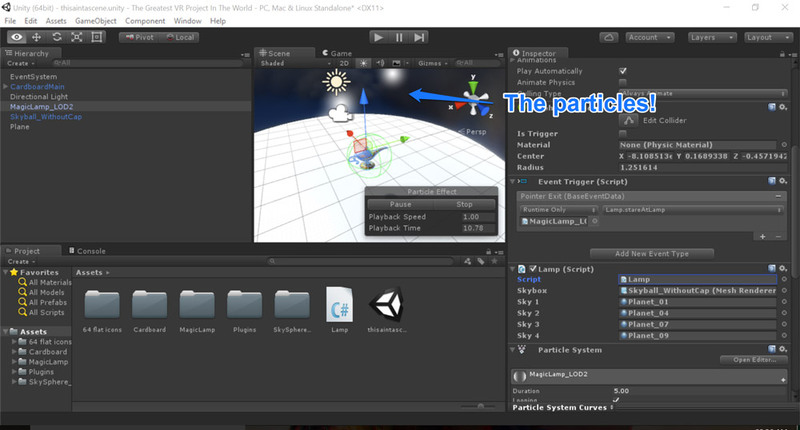 Relatively basic knowledge of Unity – I’ll cover a lot of the absolute basics for those new to it all but having a small amount of knowledge will help! 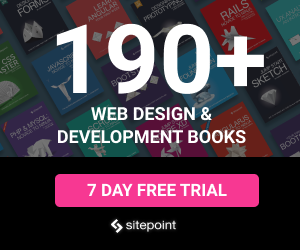 Want to jump straight into the code? 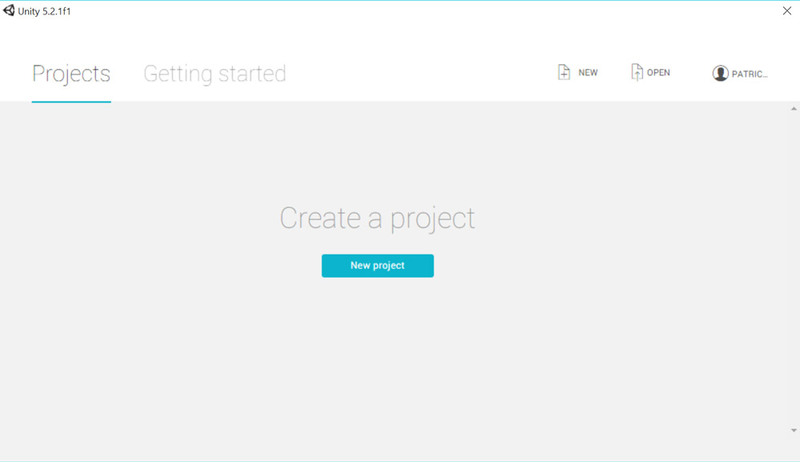 My sample project is up at GitHub for you to do whatever you’d like! 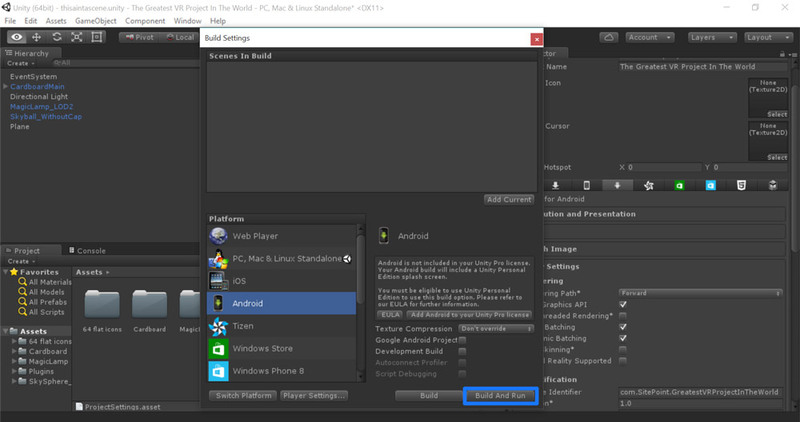 In order to create an Android mobile app, we’ll need the Android SDK working on our system. For seasoned Android developers who’ve already got this running, feel free to skip to the next section! 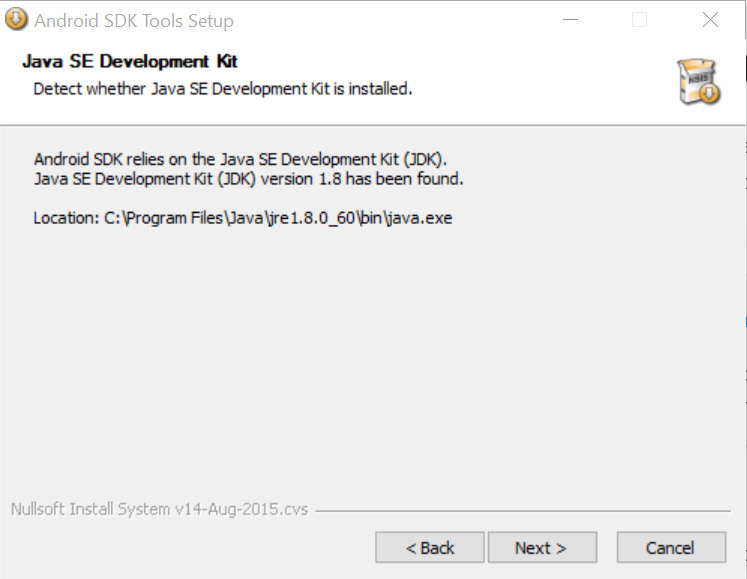 To begin the Android SDK process, you first will need to check you’ve got the Java SE SDK installed on your system. 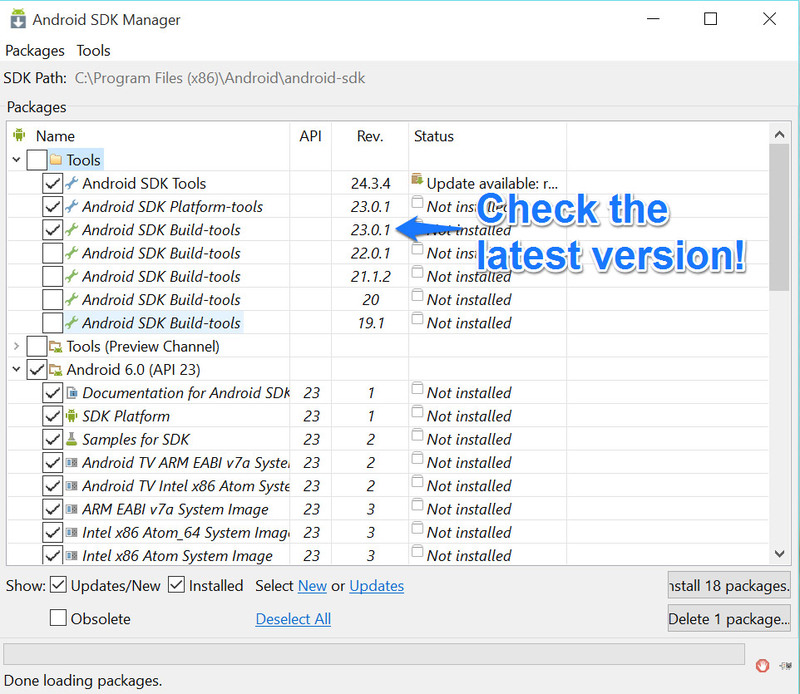 If you aren’t sure, try skipping to the Android SDK install step first. 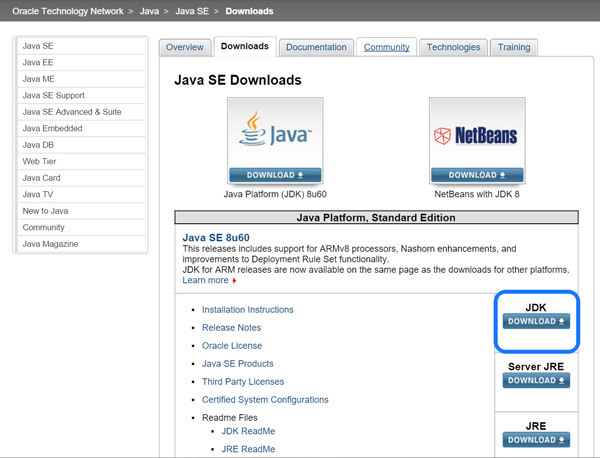 The installation will complain if you don’t have Java! 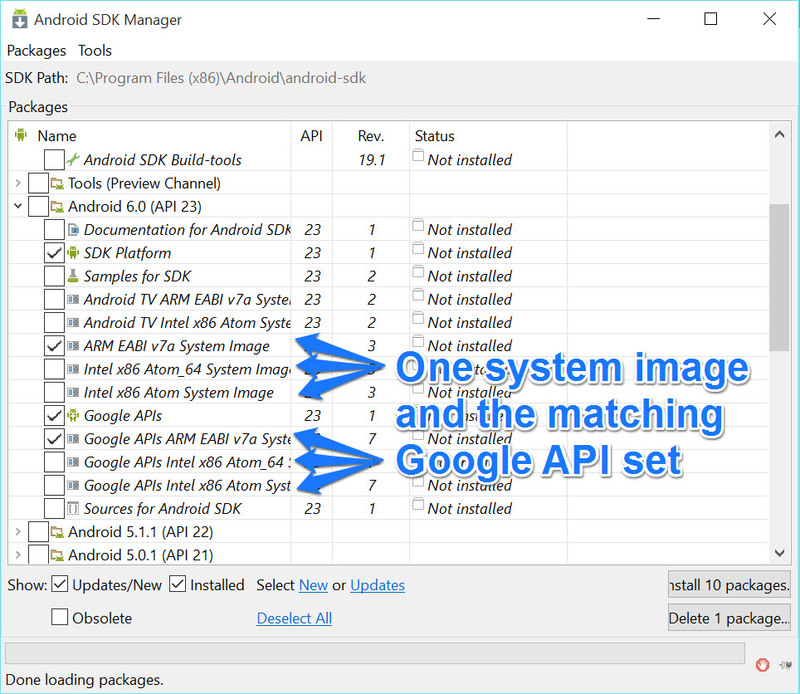 Android SDK Tools – This should be at the top of the list. 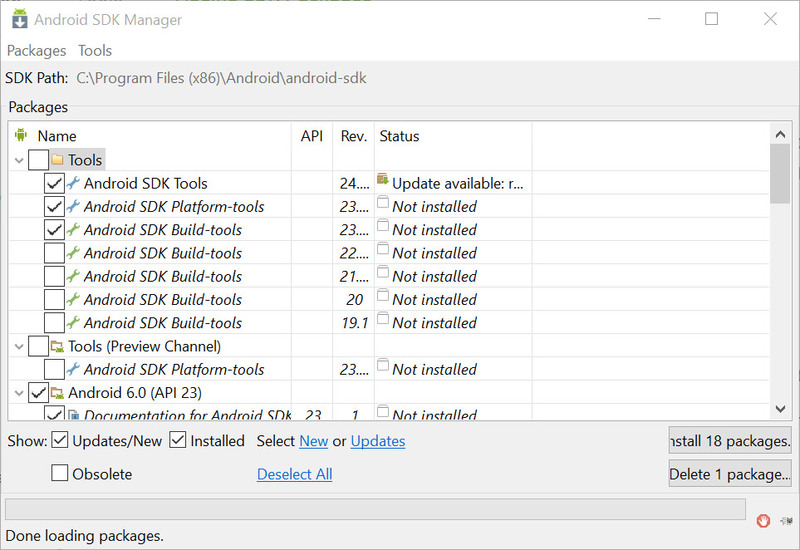 Android SDK Platform-tools – This will be right after the SDK Tools. SDK Platform – You’ll need this! 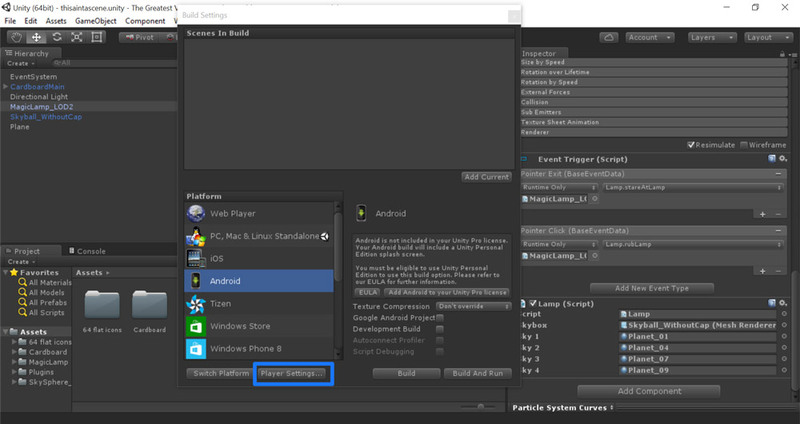 A system image – You can choose either an ARM or an Intel system image to allow you to emulate that Android system on your computer. If you’re looking to do all testing on your physical Android device, you can skip this. Google APIs – This will let us use any Google APIs with our app. This doesn’t include Google Cardboard – I’ve just included it for convenience, you can likely skip this one too. Click “Install X packages” in the bottom right corner to begin the installation process. You’ll need to accept the licence before it will let you install. Once that is installed, you should have everything you need on the Android side of things! 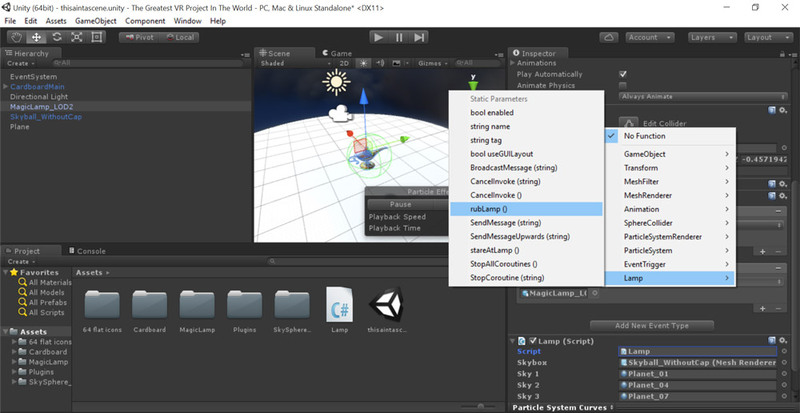 From the Cardboard SDK Github repo linked above, all you’ll really need to download is the Cardboard SDK For Unity .unitypackage file here. 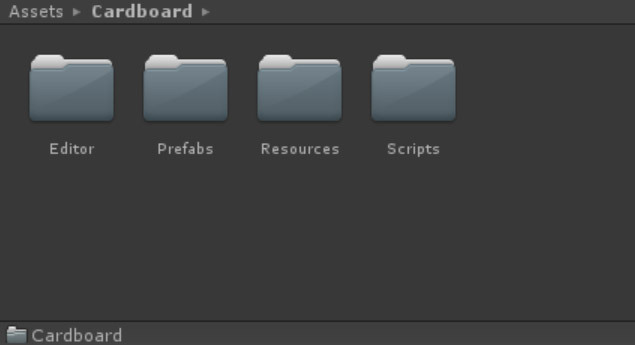 Once that has downloaded, we’re ready to begin our actual Unity project. 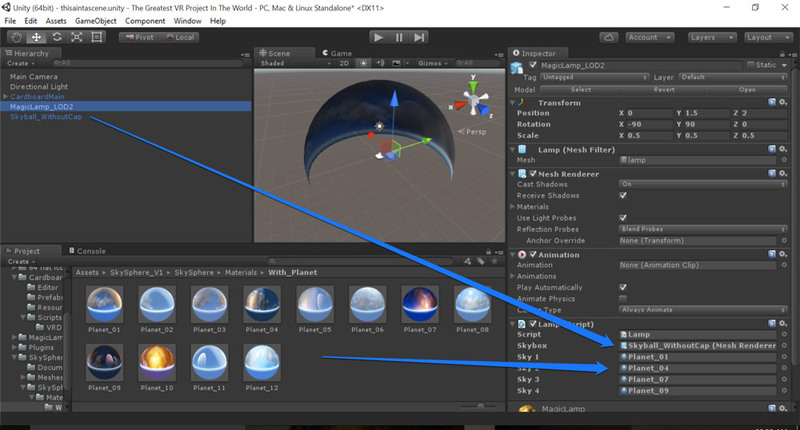 Open up Unity and do the obvious first step – create a new project. 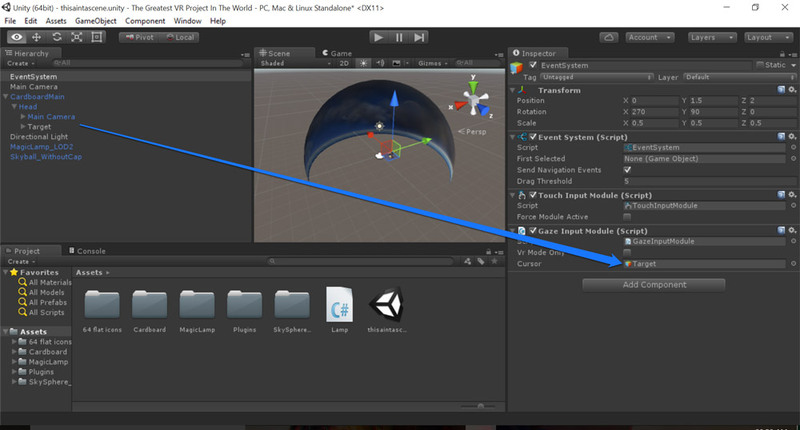 Next, go to Assets > Import Package > Custom Package… and find your Cardboard SDK .unitypackage file you downloaded earlier. Open up the “CardboardMain” prefab and you’ll find the “Main Camera” within it. 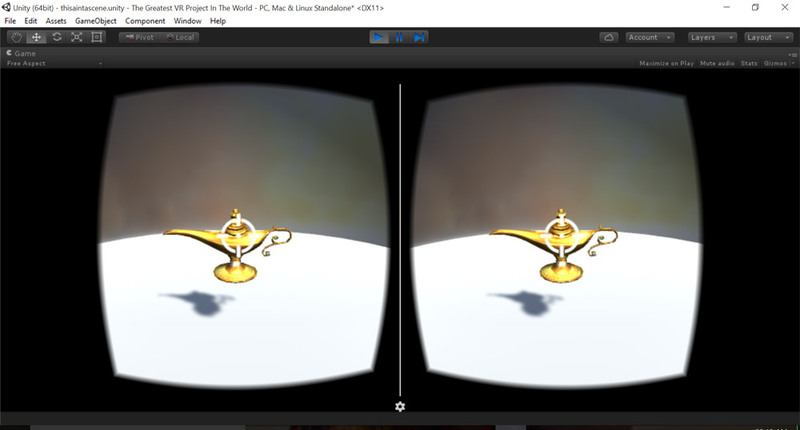 This is our two stereoscopic style cameras working in unison to display the scene in wonderous VR when looking at it though a Google Cardboard headset. 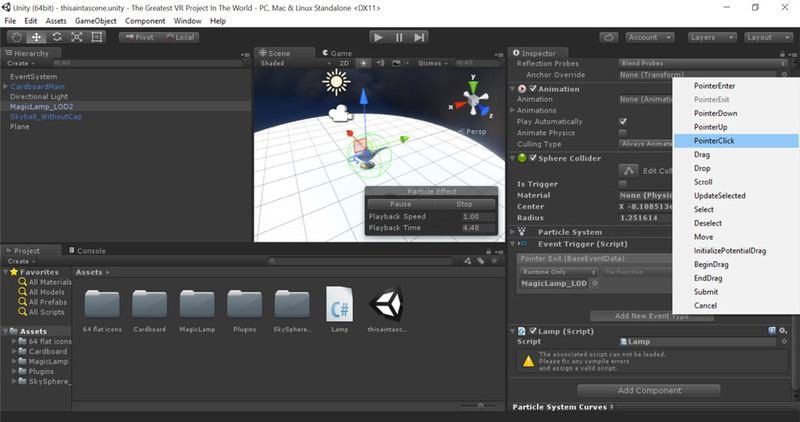 In our “Main Camera” object, we’ll want to add a “Physics Raycaster” component. 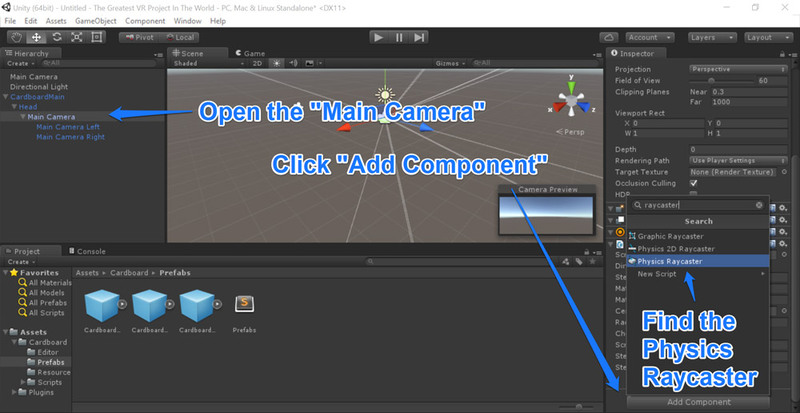 To do so, click “Add Component” whilst you’ve got the “Main Camera” open. I typically find it by typing in “raycaster” in the window that pops up. We’ll need a Physics Raycaster to be able to interact with elements by looking at them. 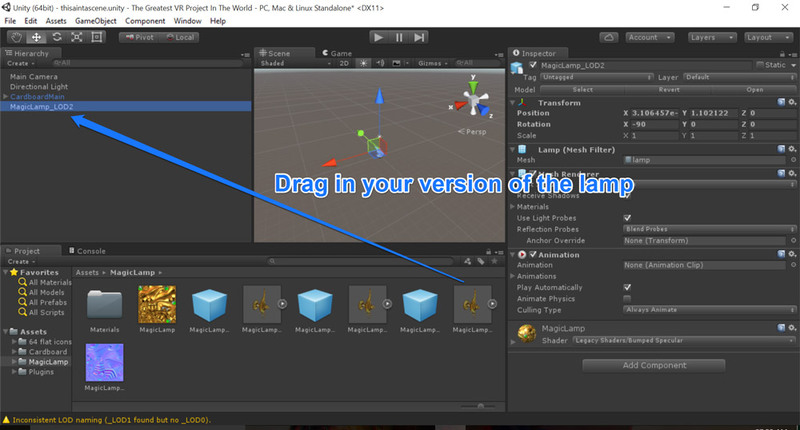 Next, you can add in an icon to show when the user is looking at an object. I used a free icon in the Unity store from the 64 Flat Game Icons pack by Office57. You could create your own sprite for this too if you’d prefer. 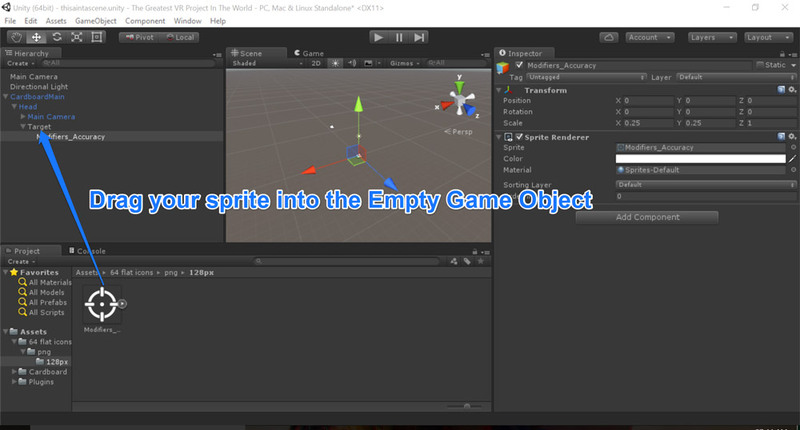 Get a sprite from somewhere and import it into your project. That should be all you need to enable plenty of very useful Cardboard view tracking and controls. The code above is pretty straightforward stuff, we set up a skybox variable, four materials for that skybox and an integer to store the number of the current skybox. 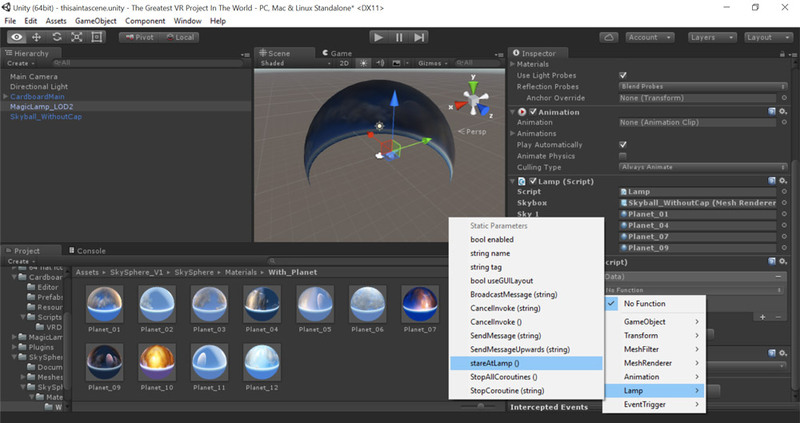 Then, we’ve got a public method called stareAtLamp() which changes our skybox’s material to the next one in the series of materials, or takes it back to the first material if we’re at the last one. 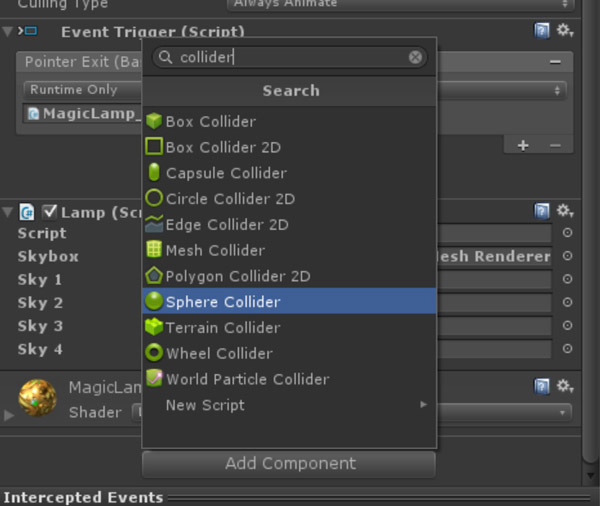 To add this code to our project, select your lamp and click “Add Component”. Type in “script” and you should find “New Script…”. Click that and call it “Lamp”. Put in our code from above. 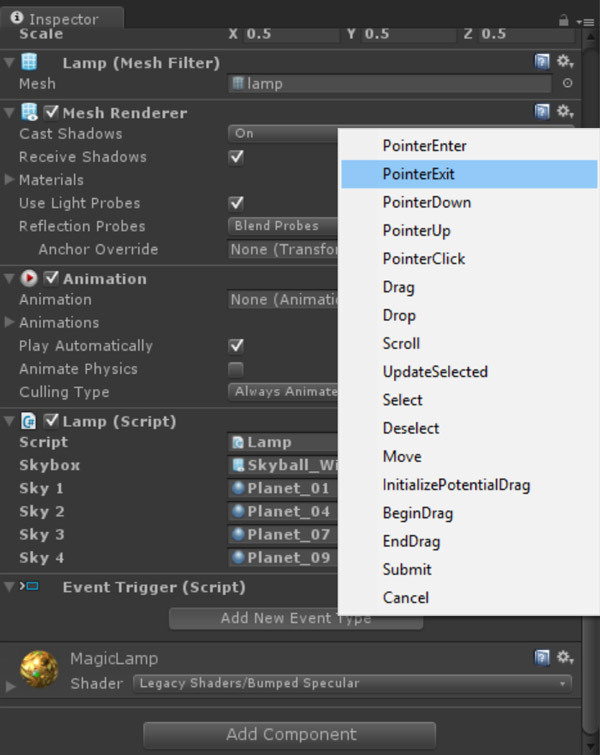 When your code is saved, those public variables will be available as options for your script. 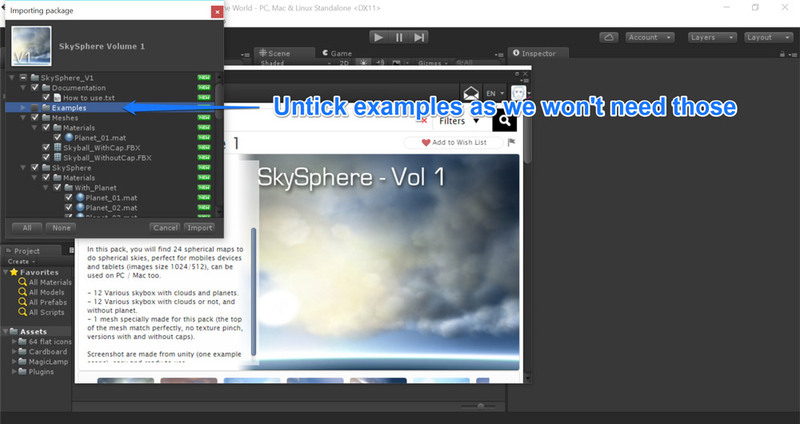 Drag your skybox object from the Hierarchy of your project into the skybox variable. 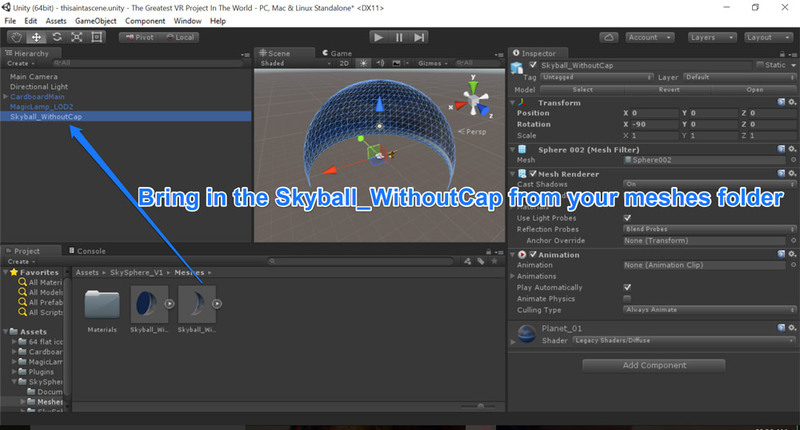 Find the materials for your SkySphere from the Assets > SkySphere_V1 > SkySphere > Materials > With_Planet folder (or whatever other materials you’d prefer) and drag a few of them into the four sky materials. This allows us to access the lamp’s functions as possible responses. 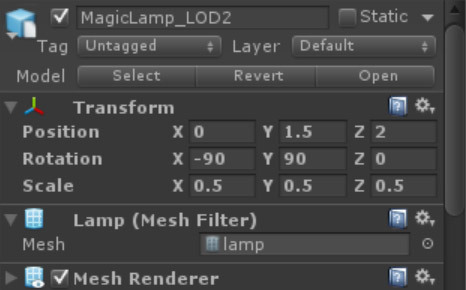 Click on the dropdown that says “No function”, find “Lamp” and then choose the stareAtLamp() function. 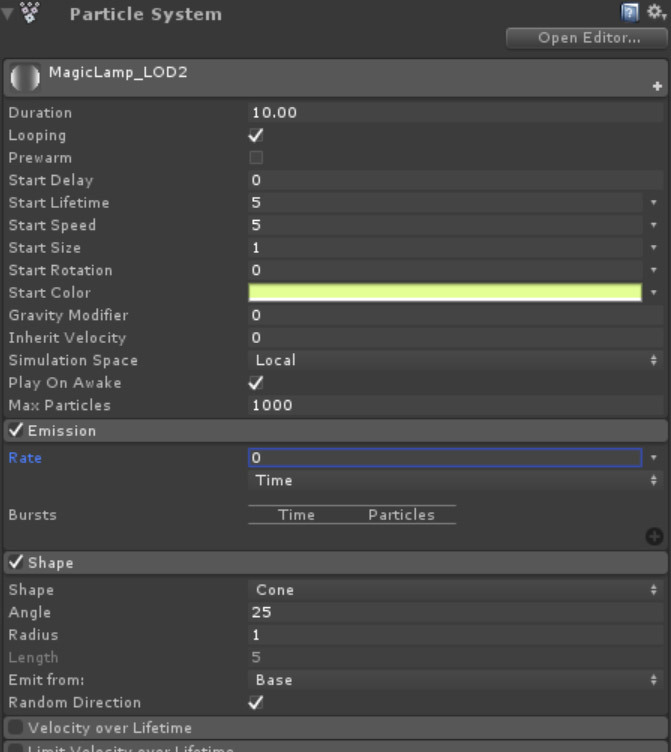 In order for the event trigger to work, our scene needs an “Event System”. 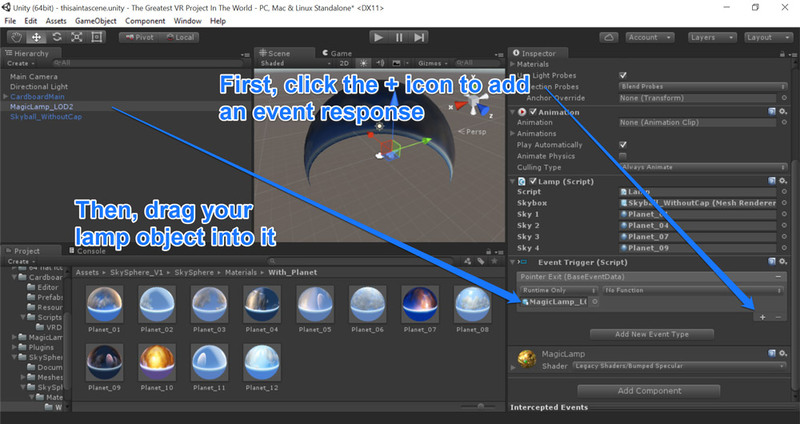 Head back to your scene and create one from UI > Event System. 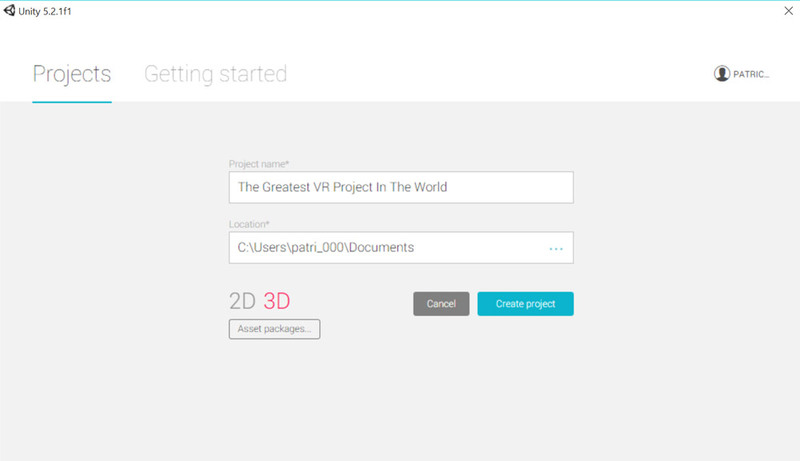 We are almost ready to test out our VR app! 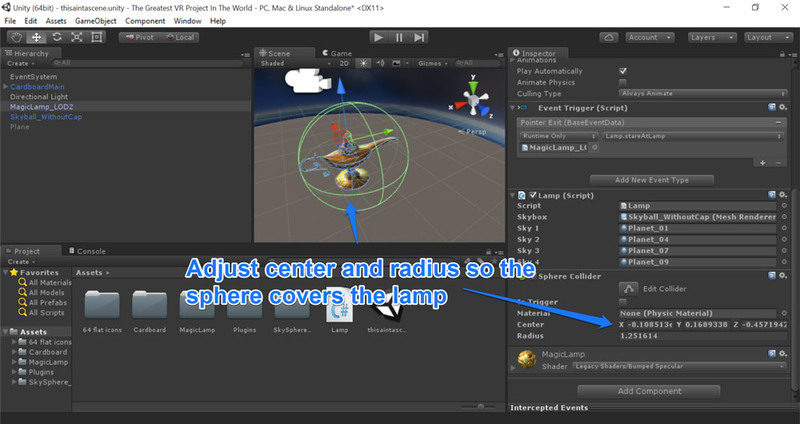 Delete the “MainCamera” object in your scene if you haven’t already instinctively removed it – the “CardboardMain” object is our new camera. 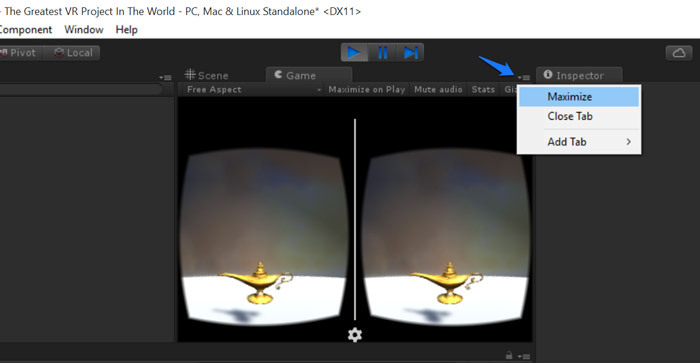 To simulate looking around your scene, hold down the Alt key while moving your mouse. To simulate tilting your head, hold down the Shift key while moving your mouse. If you look away, the sky should change like magic! Excellent, that’s our first use of the Cardboard SDK. However, there’s one more function we haven’t taken advantage of on the Cardboard headset – our clicker on the side. Here’s how to engage that. I also ended up using a “Gravity Modifier” of 1, which made the particles look a bit cooler as they fell back down over the lamp. Give that a try! 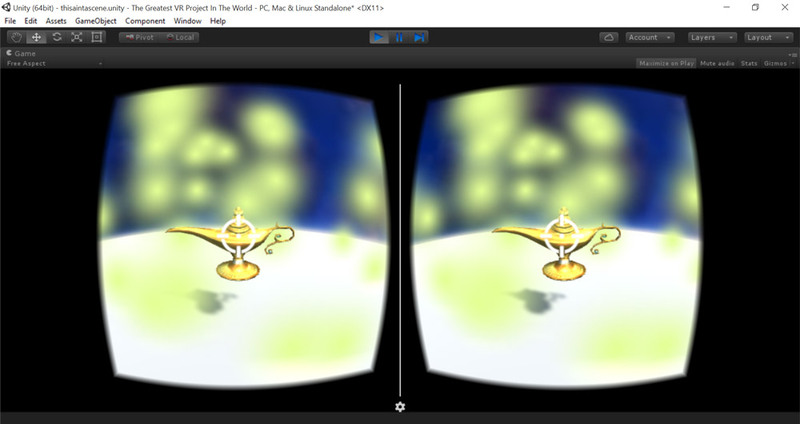 Now if we play our scene and click that lamp, we’ll have particles bursting from it. Quite neat! Unity should then run through and do everything else for you. It will place the app on your phone and run it. 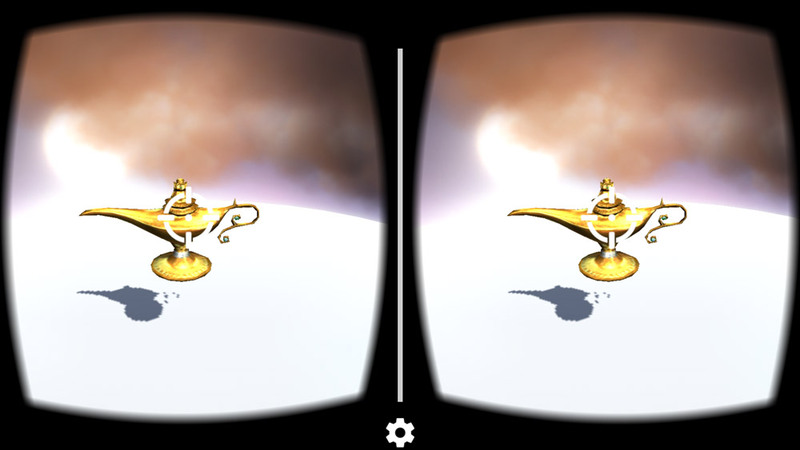 Once the app is on your phone, disconnect it from your computer, put it into your Google Cardboard and enjoy your VR creation! 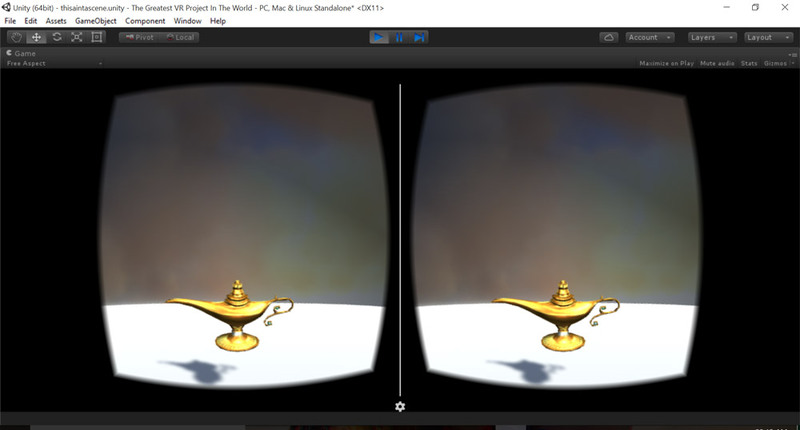 Working with Google Cardboard and Unity is surprisingly really straight forward! 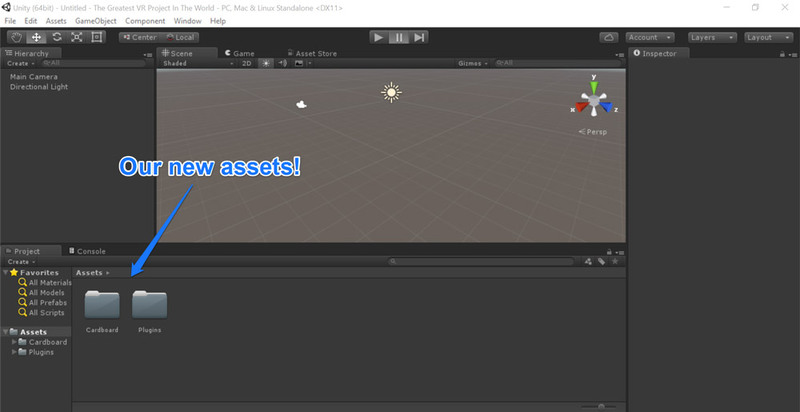 From this initial demo, you’re now empowered with all the capabilities of Unity, combined with the capabilities of a whole portable VR platform! 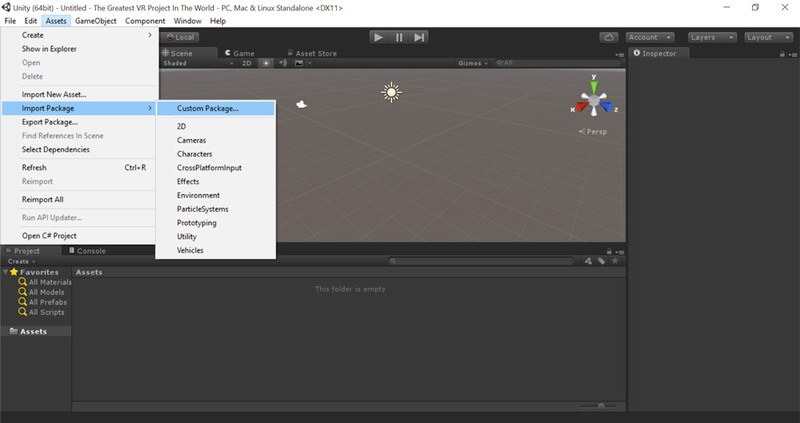 A little while back I covered calling Web APIs in Unity – the Cardboard SDK integrates well into that whole process, so you could have an IoT enabled VR Unity app if you combine the two techniques! 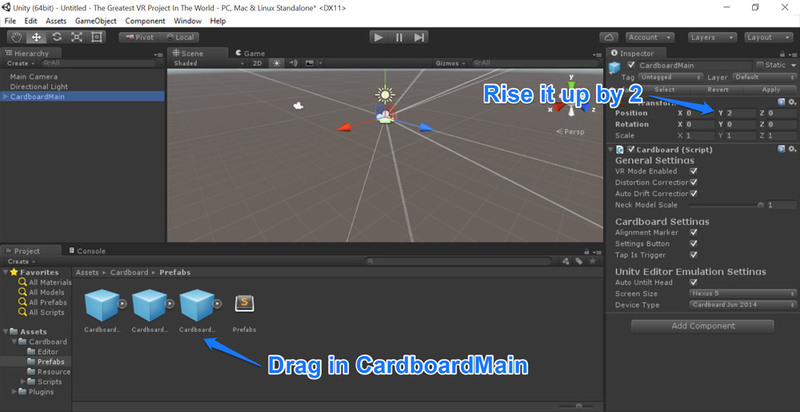 Feel free to use this code tutorial as the base for any Cardboard VR project you build in future! If you make something with it, please share it in the comments or get in touch with me on Twitter (@thatpatrickguy). I’d love to check it out! 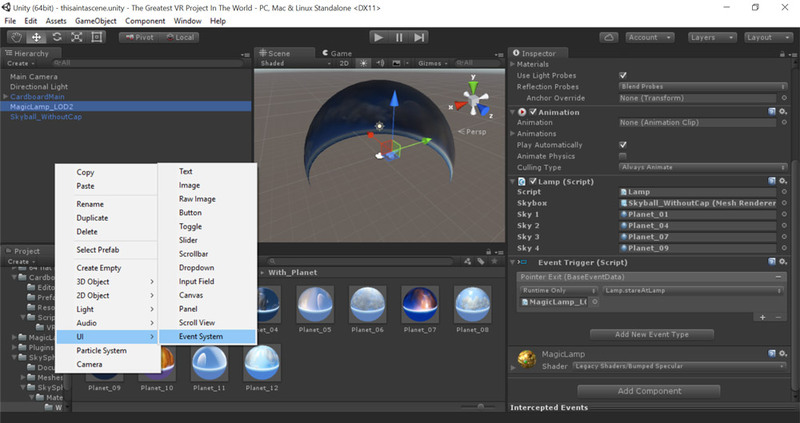 If you’re looking for other links and sample projects to guide you in VR and Unity development, I’ve got a set of curated links that might be perfect for you! 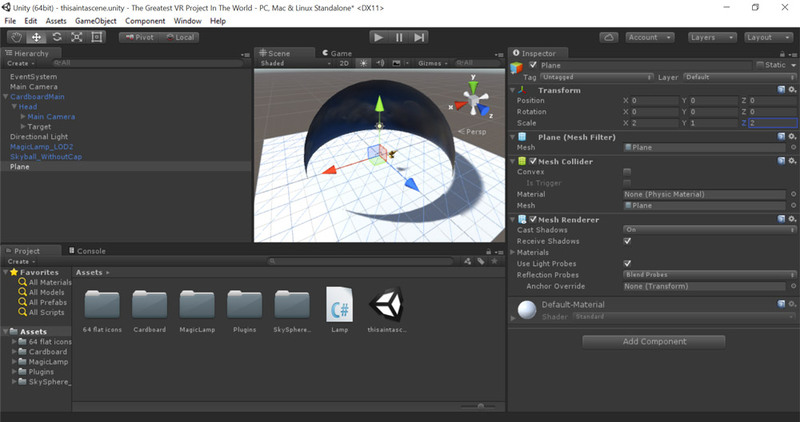 Head over to Dev Diner and check out my VR with Unity Developer Guide, full of links to resources around the web. If you’ve got other great resources I don’t have listed – please let me know too!